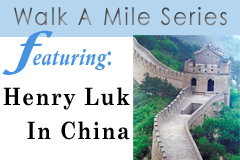 In my quest to bring to you aspects of different cultures, I am very pleased to feature: "Henry Luk In China". China is home to the single largest population on this planet. It is the most exciting opening culture in the world with a tremendous economy, second largest after the US. Please Join me in this very enlightening conversation with Henry.